Photo: Kids carry a Watch for Me NC banner in Raleigh during the Leesville Elementary Walk to School Day. Nicknamed the “City of Oaks,” Raleigh is the state capital of North Carolina and the second largest city in the state. Raleigh is also home to the 43,000 students and staff affiliated with North Carolina State University (NCSU). 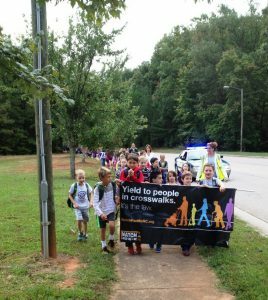 The city has been an active participant in the Watch for Me NC program as part of its goal to improve traffic safety. As one of Watch for Me NC’s original pilot program communities, Raleigh has built upon its early successes to improve safety for bicyclists, pedestrians, and motorists within the state’s capital. The Raleigh Planning Department works closely with NCSU, Triangle Transit, and the Raleigh Police Department to implement Watch for Me NC activities. NCSU has been an invaluable partner. The university hired an intern to reach out to potential collaborating agencies and develop and action plan for distribution. The intern worked closely with NCSU’s sustainability partners, campus recreation, housing, campus police, and international students office (few international students own vehicles, and therefore predominantly travel by transit, bicycle, or on foot). The Watch for Me NC program engaged the public through public meetings, NCSU Packaplooza, North Hills Tribute Friday night series, Activate 14 community series, the North Hills concert series, and the South East District Bicycle Rodeo. Watch for Me NC partners have also attended events to engage specific organizations including the Bicycle and Pedestrian Advisory Board Community Outreach Committee, Red Hat, Advocates for Health in Action, and the Citizen Advisory Council. GoRaleigh busses carry Watch for Me NC banners. Watch for Me NC partners have conducted enforcement activities throughout Raleigh as well. Initial sites were selected through intersection evaluations from the UNC Highway Safety Research Center. Additional sites were selected based on the city’s pedestrian crash map, citizen requests, and traffic complaints. Agencies managing the Watch for Me NC program have occasionally observed police officers conducting enforcement to ensure adherence to proper procedures. Rebrand to engage: As a long-term participant, Raleigh has found it important to reframe Watch for Me NC over time. Raleigh has emphasized keeping education and enforcement tactics “fresh” to keep the community engaged with the issues. Develop a task force: By creating a task force of involved parties, Raleigh’s Watch for Me NC program set up a system in which partners are held accountable to the greater group and the group’s goals and objectives. Be realistic about results: Traffic collisions and injuries will not decrease quickly or immediately upon implementation of Watch for Me NC, so Raleigh has made it a point to focus on small incremental changes. Thank you to Jennifer Baldwin and Trung Vo, former Bicycle and Pedestrian Coordinators with the Raleigh Planning Department, for contributing to the Watch for Me NC Campaign in Raleigh and the writing of this profile.